This fast charger has more features and higher ratings for the price than any competitve charger in its class. UL listed for indoor/outdoor use Safe In Any Weather. Commecial quality features make this charger a great buy. Full 135 amp load tests 6 and 12 volt batteries alternators and starters on all types of vehicles. Durable and built for safety. Recessed meter helps protect this hand-held tester from damage. 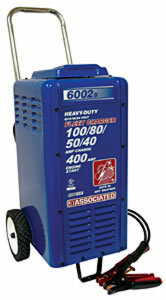 Full 125 Amp load tests 12 Volt and 24 Volt batteries alternators and starters on all types of vehicles. Leads: 2 14/2 Clamps: 300 A.